Is It Dangerous for Dogs to Eat Cat Litter? Because we love our dogs so much, we overlook their more disagreeable habits. Their propensity for sniffing out and ingesting foul objects does not seem to make us adore them any less! One of the more harmful substances which many dogs find tasty is kitty litter—especially after the kitty has littered! Why Do Dogs Eat Cat Litter? It may come as no surprise to you that coprophagia, the ingestion of feces, is a common canine activity. In short, dogs like to eat poop. They may even like the taste—as horrific as that sounds. Some experts, such as Dr. Benjamin Hart from U.C. Davis, hypothesize that coprophagia is an instinct which predates canine domestication. One wolf may have eaten animal droppings in order to minimize parasite infestation throughout the rest of the pack. Other reasons why dogs eat litter or poop might be related to nutritional or emotional deficiencies. Perhaps a lack of vitamins may be the culprit, or perhaps your dog is feeling lonely and neglected. Both avenues are worth looking into, especially if eating litter is a new occurrence for your dog. How Dangerous Is Cat Litter to a Dog? Cat litter can be quite harmful to your bestie. One reason is that most cat litter is made from materials which absorb wetness. This feature can cause litter to obstruct your dog’s intestines, requiring surgery. Clumping litter is especially harmful to your dogs, but ordinary clay litter with its liquid-absorbing properties can also be detrimental. I have read a few articles which state that ingesting kitty litter is not bad for your dog. However, an obvious health risk is the bacteria and potential parasites in kitty litter, especially if your dog is eating used litter. These bacteria and parasites can be passed on to other dogs and humans. Just because a dog’s ancestors used to eat animal feces doesn’t mean that we should allow them to continue doing so today. I highly doubt that many of us would want our dogs to lick us immediately after they have snacked on cat poop. Do not keep your dog’s food next to the kitty litter. This may inadvertently cause your dog to associate kitty litter with food. If you suspect your dog is eating the litter because of a new diet or because he or she is hungry, try to supplement the diet with low calorie treats, and with dog vitamins. I like to use human-grade nutritional yeast in my dog’s food. Dogs love the cheesy flavor of nutritional yeast, and it has many important proteins, vitamins, and minerals. Best of all, it is low calorie, and your dog only needs a teaspoon per 30 pounds of body weight. 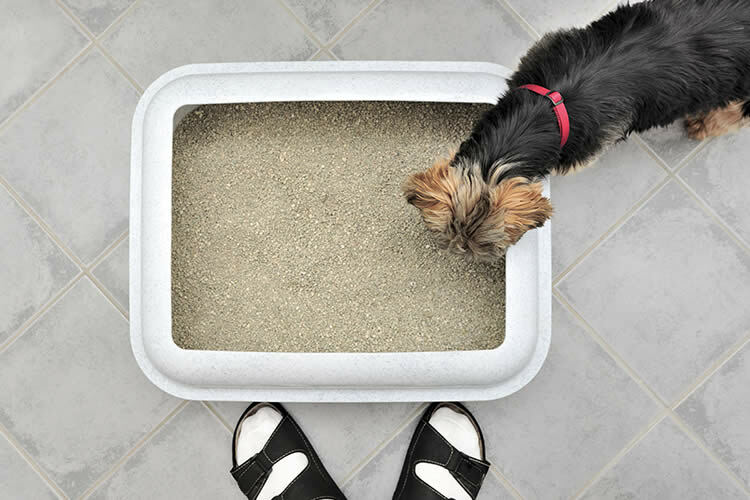 The easiest way to prevent your dog from having access to the kitty litter is to simply move the litter box to a new location. Separate your dog and cat, and close off a section of your home by either shutting the door or using a baby gate. Sometimes a baby gate is quite useful because a cat can jump over it, while a dog may not be able to bypass it (depending on the dog’s size and agility). If this is a relatively new event, try to figure out what has changed in your dog’s life. Have you moved? Is the household more stressful? Are you spending less time with your dog? Have you made changes to his or her diet? Why your dog is eating cat litter may never be answered definitively, but it doesn’t make prevention any less important. While there may be some people out there who see no harm in letting dogs eat kitty litter, I would rather err on the side of caution—as there is more than enough evidence proving its harmful effects on dogs.